GUN Fortress is GUN's top-secret base in the United Federation, featuring as a level in Shadow the Hedgehog. Built in a series of underground caverns (Rouge the Bat comments that the Fortress is subterranean), it houses the three Mother Computers that co-ordinate those remaining forces resisting the Black Arms invasion. Due to Shadow the Hedgehog's branching path structure, GUN Fortress is one of five possible sixth levels - and this is the "evilest" one, played only if Shadow has spent the majority of the game following Black Doom's anthrocidal orders. If you've completed The ARK's dark mission and deactivated Space Colony ARK's defenses, the Black Arms take advantage of the opportunity and seize control of the Eclipse Cannon. After Black Doom telepathically broadcasts a speech demanding the surrender of Earth's forces, the Eclipse Cannon is fired at Central City to show that the Black Arms mean serious business. Nothing is left of the United Federation's former capitol but a smothering crater, though all of its residents have been safely evacuated beforehand. If you've completed Air Fleet's dark mission, the President escapes within an inch of his life of the would-be political assassin Shadow the Hedgehog. The rather flustered leader is taken to the deepest part of G.U.N. 's subterranean headquarters, where the G.U.N. Commander assures him that their forces will rally. Unfortunately for the humans, over a thousand alien invaders have managed to breach the fort's outer defenses, including stark raving mad Shadow. Either way, things aren't looking so great for humanity in their struggle against the Black Arms. G.U.N., the only real force capable of mounting a competent defense, has been reduced to barricading what remaining forces it has at its center of command. Shadow is tasked by Doom's Eye to destroy the three mother computers which churn out G.U.N. robots. Taking an uncharacteristic change of heart, Rouge the Bat is determined to prevent the Black Arms from swiping the last Chaos Emerald that lies at the end of the base. It's your choice whether to aid Doom's Eye or Rouge. If you're misanthropic to the core and help the Black Arms in destroying the mother computers, Sonic the Hedgehog and the G.U.N. Commander (piloting the prototype battle robot Diablon) confront Shadow in Earth's absolute last stand. Defeat them and Shadow will finally acquire all seven Chaos Emeralds. The fallen Sonic asks what Shadow plans to do, and Shadow replies with his intention to dispense justice to humanity by destroying their planet. Cue maniacal laughter, screen fade, credits. ...Or you could atone for your wicked ways at the last minute by securing the final Chaos Emerald from the Black Arms. Black Doom is quite cheesed off by your impromptu treachery and intends to personally teach you a lesson. After you defeat him, a weakened Black Doom promises that the Black Arms aren't finished. In the most grandiose one-up of all time, Shadow retorts that he plans to use the seven Chaos Emeralds to take his rightful place as the ruler of the entire universe. Cue maniacal laughter, screen fade, credits. Gameplay in G.U.N. Fortress has some similarities to that of Air Fleet, the other level in Shadow to be set in a United Federation military facility. Extremely long, curving corridors are to be found throughout, interspersed with occasional larger, circular rooms, and large underground caverns (bordered by bottomless pits) where the Mother Computers can be found. The main distinguishing feature of the Fortress, however, is its waves and waves of GUN mechas. While footsoldiers are present in the vehicle depot at the very start of the level, bipedal mechs soon take over the defense of this last human stronghold. 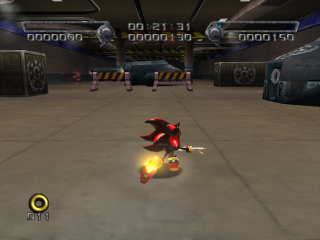 Fighting in this level takes Shadow gradually downwards, as he delves further and further towards the core of the base. Underground roads bored through the bedrock make up most of the passageways, although quick sprinting through is impeded because the defenders keep closing blast doors right in front of you, which have to be shot or spin attacked to pieces - a similar situation occurs in the Soleannan stronghold of Aquatic Base in Sonic '06. GUN robots also tend to teleport in on Shadow while the doors hold him up - functioning more as an ammo supply than a threat, in reality. Some of the larger rooms require you to destroy all enemies in the vicinity in order to unlock grabrail machines that take Shadow to an upper exit; use of fixed turrets to take out high-up enemies is necessary. A curious and unique feature if taking the Doom's Eye's Dark route comes when approaching the Mother Computer caverns. The view switches from a third-person perspective behind Shadow, to the security camera feed of the corridor in question. Adjusting to the sudden change in control style can make the sections far more difficult than one would expect, as Shadow is supposed to move swiftly between patches of cover to prevent the camera's auto-cannon from opening fire. When normal perspective returns in the Mother Computer chambers, Shadow has to carefully jump between strobing laser doorways above bottomless chasms. Climbing on turrets is again necessary to destroy the huge blue mainframes, as they're positioned out of range above freight lifts that disgorge an infinite supply of combat mechas. This secret door can be easily found just following the normal path. After passing the second mother computer, you'll head to a tunnel with some shutters and GUN robots. At the end is a Big Foot, a ring pole, and the secret door. Inside the door is an armored GUN vehicle and a hidden passageway. Get in the vehicle and head on forward. After taking the hidden passage, you'll see a blue barrier and past it will be the room with some grindable blue pipes. This shortcut is very useful for the hero mission, as it bypasses lengthy and mech-filled sections of the level.